The student who asked the Witch questions of me in December asked a follow-up question out of the blue this morning. We were taking notes for new vocabulary words before we started our bingo review game. Others were still writing and he was finished. Later, after while students were finishing another set of notes, he asked about Halloween. I at first wasn’t sure I heard him right and asked him to explain himself. The class then go a mini cultural lesson about how pre-Christian ancient Celtic cultures would carve lanterns to help guide the spirits of their beloved dead, their ancestors, back home. I explained that this is a custom that is still done with the same meaning in some parts or Ireland and in the US by some people and is similar to a very wide-spread celebration in Mexico. When Christians came, oeooke were told they were inviting in demons, not ancestral spirits, and so the lanterns started to look like scary faces to chase the demons away. The conversation continued to another student wishing humans could just be anything and why does everyone and everything have to be Christian. I responded that I’m not Christian and that’s ok. Everyone quickly agreed. The student who started the question then asked me, quietly, “Are you Pagan?” to which I honestly answered affirmatively. Despite all of the side bars we had today…we also talked about why humans have hair in their nose…we finished all of our vocabulary notes, played two games of vocabulary bingo, and diagrammed a sentence. He has apparently been doing some kind of research on his own to use the words he did today. And I have zero concern professionally because my principal, Ms. T, is amazing and referred to me as a “hard worker” in an unrelated conversation today. It feels beyond good to know that I work in a place where I can be open, not advertising but still open, and have zero concerns for reprocussions. Tonight was my first public Heathen ritual. 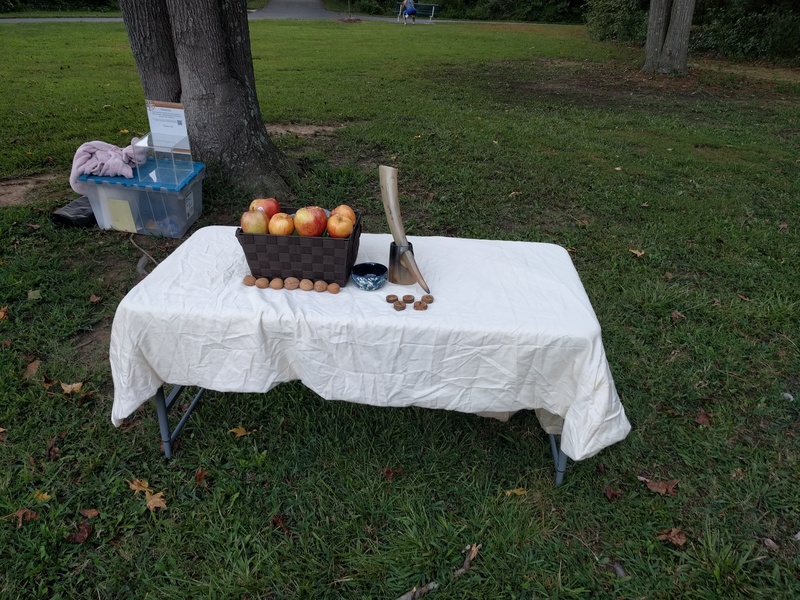 I lead a Full Moon Ritual welcoming the season change, Winterfinding, apples, and Idunn. Witchlette joined us and lent her Magicks, which made the ritual that much more special. Also super special was the bunny who joined us. I mention in this ritual, and I mentioned it before we started this evening, that Idunn is also known as her counterpart Ostara. The bunny didn’t come super close, but it also wasn’t skiddish. It didn’t see us and hop away as a bunny typically would. It stayed for the entire ritual and just did it’s bunny thing. Fire melts the ice. The water mixes with the heat to make steam. The ice cools the steam to make mist. The mist fills the gap between fire and ice, where there was nothing. Mist of the world from where all life springs. We are standing here, in the SE of the US where it is still summer and still hot. It will still be rather warm for weeks to come. Tonight, with the light of the full moon, we are going to travel through time and place. We are going to venture northward to an unforgiving ancient land of extreme cold and extreme dark. The times of the Northman of the past was ruled by the Sun. Northern nations have the same solar calendar as we do, but theirs is much more extreme. There are two solar seasons: summer, when days are long and winter, when days are short. Mid-Summer is called such because it falls between Summerfinding, in March when the days begin to grow longer, and Winterfinding, in September when the days begin to grow shorter. The sun is in the sky for 18 hours on midsummer. On their Winter Solstice, they have only six hours of sunlight. Their world was ruled by light and dark. What can and cannot be accomplished in the time of light available. We have found ourselves in the time of Winterfinding once again. While it is still warm here in North Carolina, the sun is beginning to set earlier and the days are beginning to shorten. Winterfinding is one of the two times sacred to Idunn. Many of you may know her better by her German counterpart- Ostara. Idunn is the bearer of the apples of youth. She keeps these sacred apples and allows the Aesir and Vanir to have a taste. Idunn spends many afternoons in her apple trees, tending to her orchard. One day, while sitting in her tree, she caught a chill, became faint, and fell from her tree to the ground. Her still body lay on the green grass, which slowly turned brown. Leaves began to fall all around her. Back in Asgard, Braggi began to fret about the whereabouts of his beloved. She typically would have returned home from her orchard by now. It was getting cold. Braggi formed a search party with Thor and Ull. The three gods went out through Asgard to Idunn’s orchard and there found her laid on the grass, her basket of apples lay tucked at her breast, their golden color never fading. Braggi removed his white fur cloak from his back and laid down next to Idunn, covering both of them with the cloak. He, and his white fur, would keep her well until the fainting spell passed and she was of whole mind and body again. Thor and Ull, with Braggi’s persistence that Idunn not be moved, that the best place for her was to remain in her orchard, returned to their halls. There they lay for many a night, Braggi holding tight to his beloved, kept hidden and safe beneath their white shield from the outer world. Here, she was kept safe by Braggi until ready to rise again, shedding the white fur cloak and standing to her apple trees budding anew. Iðunn is invoked by modern Heathens as the goddess of regeneration, for her help in regenerating and revitalizing not only the body and mind, but the soul. She is called upon to help revitalize and restore Heathen spiritual traditions. Iðunn is also seen as a patron of other restoration projects, whether habitat or heritage restoration work. Iðunn is very sweet and innocent. Working with her is bound to highlight your own and other’s innocence. Call on her when you are feeling grumpy, world-weary and burnt-out. She is a leisure goddess, who can help you carve out time for much needed rest and relaxation. To honour her, welcome Iðunn to any social gathering. As a goddess of vitality and maintainer of good health, Iðunn can be called upon to increase your motivation to live a healthier lifestyle. The expression “an apple a day keeps the doctor away” might be a fun, modern adage that references her gifts. Iðunn can be seen as a goddess of preventative health, and the ultimate spa goddess. Working with her can help you find an exercise regimen that is also fun, playful and uplifting. Idunn of the apples, Idunn of constance, Idunn of youth. Hail to you! Let the others quarrel about who sits higher than whom, and whose sword is sharper and whose spear is keener. You know your place is indispensable, working the orchard without which the plans of others would come to nothing. Giver of health and immortality. Keep our bodies sound and strong! Keep us healthy that we may, like you, get up each morning while the rest of the world quarrels and go quietly to our tasks of working the earth- whether it is to harvest and complete winter preparations or to sow anew and make summer preparations. Help us in our daily round of earthen labor, Lady of the Sacred Orchard, and may our harvest be plenty, our roots stay strong through the winter, and our future gardens bloom. Idunn has caught chill. She is feeling faint. She is beginning to fall. Soon, Braggi will come to her aide and wrap her warm beneath his snow-colored cloak. As the cold season approaches, use your Hygge and hunker down with loved ones. Yesterday was a wonderful day for us, full of love and laughter. The little Witches and I went trick or treating in the afternoon around a nearby development, then we made rounds in our development after Hubby got home from work. We sat together for dinner, which I made earlier in the day knowing our evening would be jam packed with all the fun activities we had planned. I followed everything up with a trip to Magick Circle for the Samhain celebration. Witchling was put to bed and Witchlette enjoyed a night at home with just her and Daddy. In my way to the celebration, I was hit with a pang of guilt. The terrible resurgence of mom guilt. I wanted to attend, my soul needed to attend, for wholeness. For sanity. Because I feared that by not attending, I would be missing out. But, I was missing out anyway… missing out on time with Witchlette on Halloween night. During ritual, the guilt flourished. Here I am, partaking in the celebration of the life of those who have left but to do so stepped away from the lives I have grown within myself back home. After ritual, and social time at Magick Circle itself, a group of us went to a local pub to continue our fellowship of the evening. Laughter conversation filled the air. Here to, is life worth celebrating. To life, kith and kin.